1.Gabriella R. Sterne. "Signaling mechanisms of Down syndrome cell adhesion molecule in presynaptic arbor size control." University of Michigan.2016. Description Bafetinib (INNO-406) is an orally bioavailable, dual inhibitor of Bcr-Abl and Lyn-kinase with IC50 value of 5.8 nM/19 nM, respectively. Bcr-Abl kinase assays were performed in 25 μL of reaction mixture containing 250 μM peptide substrate, 740 Bq/μL [γ-33P]ATP, and 20 μM cold adenosine triphosphate (ATP) by using the SignaTECT protein tyrosine kinase assay system. Each Bcr-Abl kinase was used at a concentration of 10 nM. Kinase assays for Abl, Src, and Lyn were carried out with an enzyme-linked immunosorbent assay (ELISA) kit from Carna Biosciences. 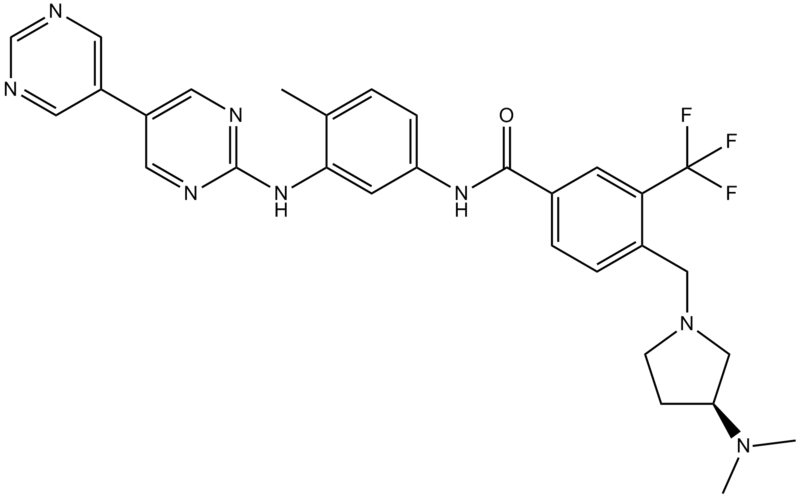 The solubility of this compound in DMSO is > 10 mM. General tips for obtaining a higher concentration: Please warm the tube at 37℃ for 10 minutes and/or shake it in the ultrasonic bath for a while. Stock solution can be stored below -20℃ for several months. Bafetinib could suppress the growth of the Bcr-Abl–positive cell lines K562, KU812, and BaF3/wt. Bafetinib suppressed the growth of Bcr-Abl–bearing tumors (KU812) and markedly extends the survival of mice bearing such tumors.
. Kimura S, Naito H, Segawa H, et al. NS-187, a potent and selective dual Bcr-Abl/Lyn tyrosine kinase inhibitor, is a novel agent for imatinib-resistant leukemia. Blood, 2005, 106(12): 3948-3954. Bafetinib is a potent and selective dual inhibitor of Bcr-Abl/Lyn tyrosine kinase with IC50 values of 5.8nM and 19nM, respectively . Bafetinib is a specific dual Abl-Lyn inhibitor. For 79 other tyrosine kinases, 0.1μM bafetinib can inhibit 4 of these enzymes including Abl, Abl-related gene, Fyn and Lyn. 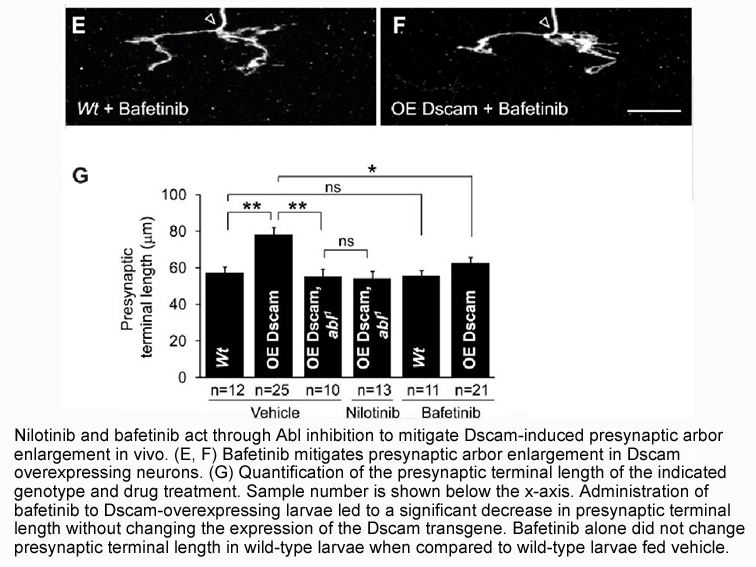 Bafetinib can block the autophosphorylation of Bcr-Abl. In K562 and 293T cells transfected with wt Bcr-Abl, bafetinib shows inhibition with IC50 values of 11nM and 22nM, respectively. In the in vitro kinase assays, bafetinib shows inhibition of a variety of Abl kinase mutants such as M244V, G250E, Y253F and F317L. It has no effect on T315I in vitro. Bafetinib also suppresses the growth of Bcr-Abl–positive leukemic cell lines including K562, KU812 and BaF3/wt. The BaF3/E255K cells are also sensitive towards bafetinib. 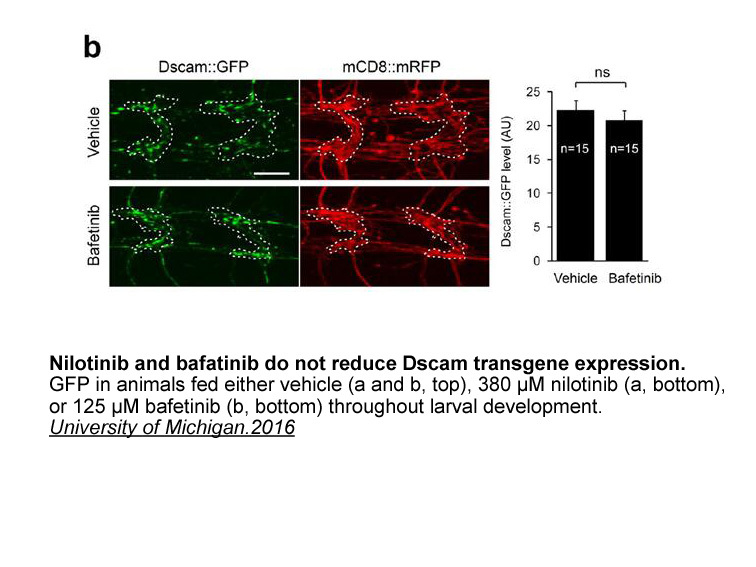 Moreover, bafetinib is highly potent to inhibit tumor growth in murine tumor models . Kimura S, Naito H, Segawa H, et al. NS-187, a potent and selective dual Bcr-Abl/Lyn tyrosine kinase inhibitor, is a novel agent for imatinib-resistant leukemia. Blood, 2005, 106(12): 3948-3954.